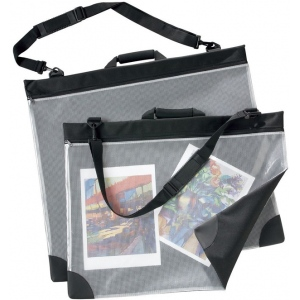 Durable yet lightweight these soft-sided portfolios are constructed of black water-resistant nylon on the back and see-through vinyl with mesh webbing on the front. * Features reinforced corners on the bottom and a smooth-running nylon zipper. * Reinforced foam handle and detachable adjustable shoulder strap. The gusset size is 1". The material is nylon, vinyl.